While keeping its turn-of-the-century industrial charm, this three-bedroom duplex loft was given an architect’s renovation, with both details and space arranged to accommodate modern family life. The Ansonia Court Clock Factory at 420 12th Street may be a loft among the brownstones of Park Slope, but the co-op complex is a favorite in the area. 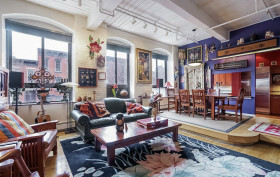 A pretty central courtyard, warm-yet-industrial loft apartments and a laid-back, convenient South Slope location make homes here unique and sought-after. 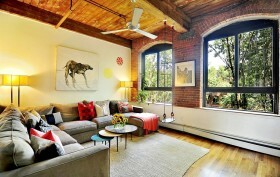 Residents generally put their own stamp on their own brick-clad lofts, and this three-bedroom duplex is no exception. The $1.9 million price tag does seem like a lot for the real space, and the co-op lacks the amenities of a full-service building, but people truly love the Ansonia’s charm, so we’re guessing this duplex will do pretty well. 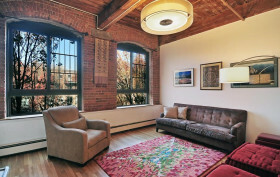 We recently mentioned south Park Slope‘s coveted Ansonia Court at 420 12th Street when we featured a compact loft in the Carroll Gardens Mill Building. The two are somewhat similar on the outside; this former clock factory is also a converted industrial building in a neighborhood of pre-war apartments and row houses. But this two-bedroom co-op is far from small. It could easily be converted to three bedrooms, and its four-rooms-on-paper have outsized proportions. The home’s current owner has made a colorful home in the high-ceilinged, brick-and-window lined loft, but whether quirky, minimalist or rustic, the original factory construction wouldn’t go unnoticed. Here’s a head-turner just two blocks away from Prospect Park in Park Slope‘s coveted Ansonia Court loft building. 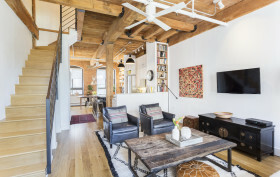 The $1.575 million third-floor duplex offers exposed brick, oversized arched windows, and wood-beamed ceilings, along with a floor plan that can accommodate two or three bedrooms. There are lofts, and then there are lofts like this three-bedroom, two-and-a-half-bath duplex in an 1880s factory building at 420 12th Street. Once home to the Ansonia Clock Company, the building was converted into a co-op by Hurley & Farinella Architects, nearly a century after being constructed. With intentions of keeping the building’s provenance intact, the architects worked diligently to maintain original details like exposed brick, factory beams and wood ceilings, and combined them with modern updates that mesh seamlessly with the building’s historic bones.